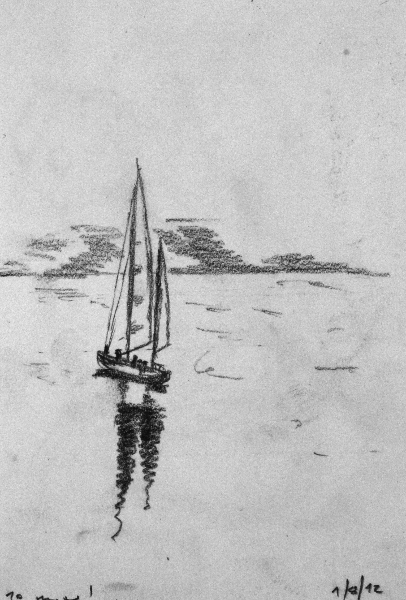 A Yacht in “Kerrera Sound, Oban, Scotland” according to the notes. This is actually one of my favourite sketches because It actually looks like I wanted and I managed to finish it within ten minutes, which is something I try often but rarely manage. 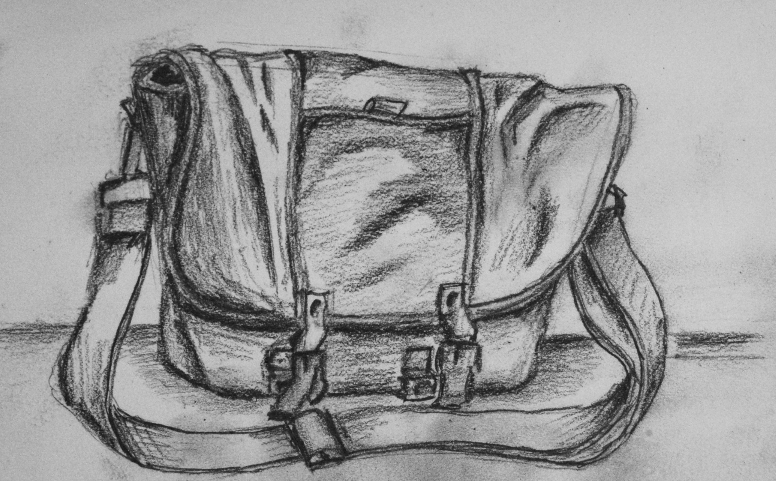 Introvert’s survival kit: The canvas bag I use to carry my sketching stuff, notebook and other stuff I like to have with me. I’d use an ex-army backpack but I’m told by people with fashion sense that this is Not Done, and may attract attention. I wish to make it very clear that despite appearances this is not a ‘handbag’. Sometimes I’m a bit stuck for interesting subjects. 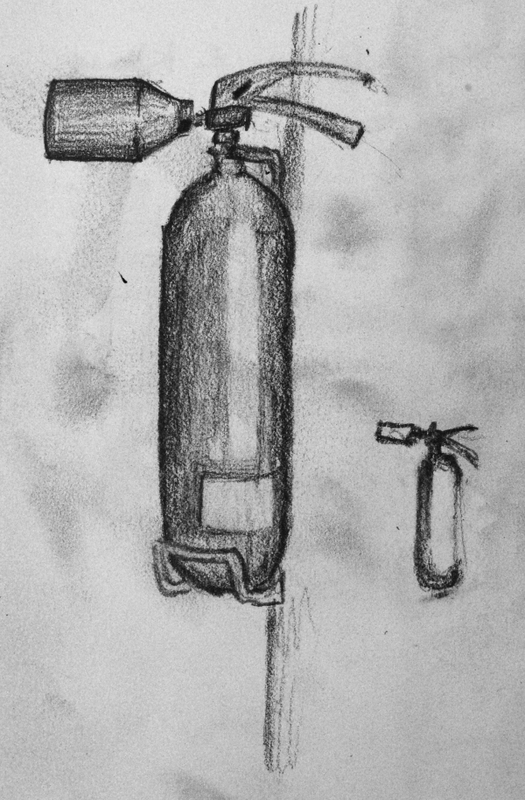 Fire extinguisher in a classroom at college. Smaller version was a practice in fast sketching. 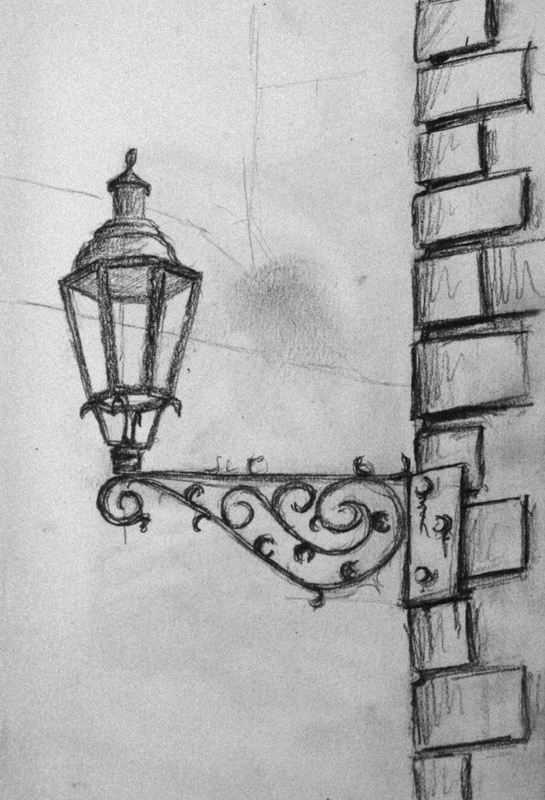 Our local town has lots of streetlights like this on the corners of the historic buildings, although the absence of a bulb does make me wonder why. Possibly they should give the streets a nice period atmosphere, or maybe hold something more illuminative in winter. The tower from the main railway station in Stuttgart from outside the Opera House. There really is a three-pointed star on the top of the tower. It is lit at night and it turns slowly. The crane in the background is for a hideously controversial rebuilding project called ‘Stuttgart 21’ which is a multi-billion euro rebuild of the railway station that will cause chaos for about five years, and if completed will actually reduce the station capacity from what we have now. 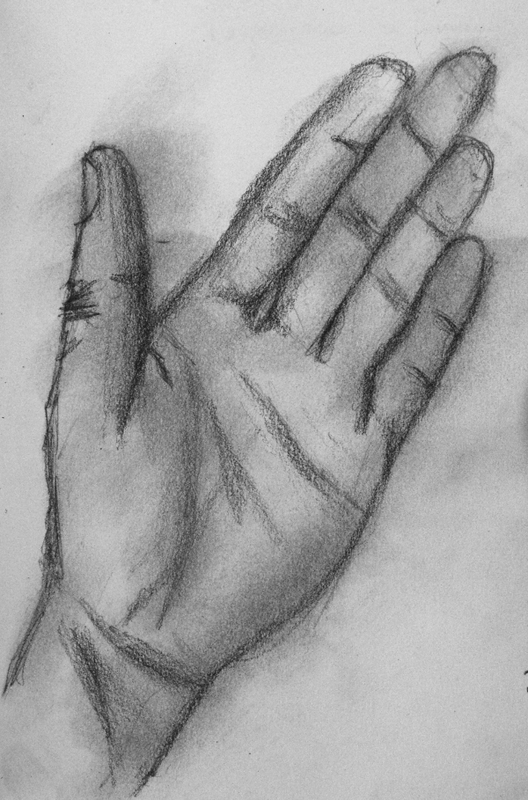 It is surprisingly hard to draw your left hand like this, and hold the paper on the table. Drawings and more updates from Japan will come as soon as I’ve finished travelling about and have a connection again. 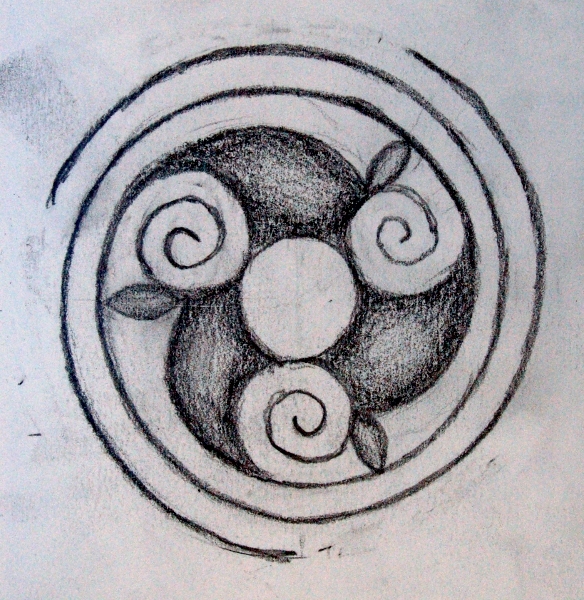 Doodle of a Pictish spiral, or Japanese spiral depending on where it is. There’s a lot of similarity between Pictish/Celtic art and Asian art, which is probably because the Celts likely came from Asia many, many years ago. Today is my Mum’s birthday, so this post is also to wish her a happy transition into the next year. It’s a bit tough being so far from someone you love on their birthday, but in a few weeks we’ll all be in Germany together so we can celebrate then. 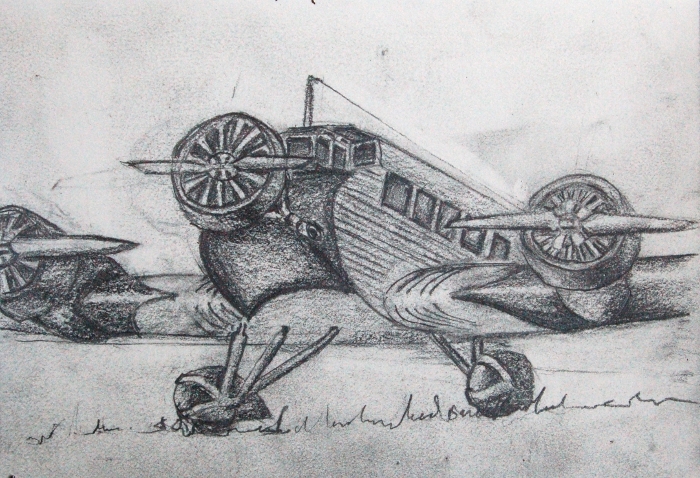 Sketch of a Junkers 52, a German military and civilian transport plane in the 1930’s, 40’s, and 50’s. 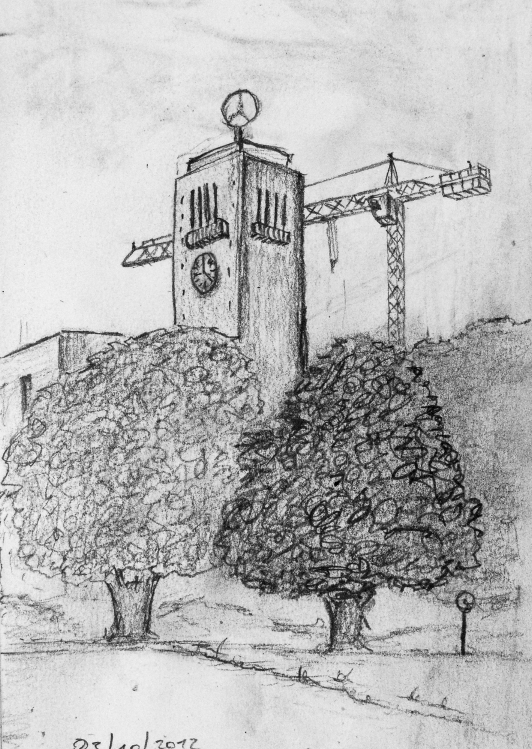 I drew this from a photograph in our college library. We will be flying to Japan next week so Beautiful Wife’s family can see her and the boys. Fortunately we won’t be on one of these as they could only make about about 100km/h (60mph) flat out with a following wind. Instead we will be using an environmentally destructive jet plane. Doing this every couple of years gives life as a treehugger a certain tension, but I wasn’t thinking of that when I met a cute Japanese girl 14 years ago. It wouldn’t change my mind now, either. I’m aiming to make Thursday ‘sketch day’, to keep me motivated to draw things, and as a shameless attempt to increase my posting rate. I can generally justify them under ‘simple living’, as long as I don’t think about the logic too much. Church in Nürtingen, as seen from the top floor of my college. I actually had no business being in the top floor of my college as it is a completely different department to mine, but it was winter and I’d had enough of eating in the cafeteria. 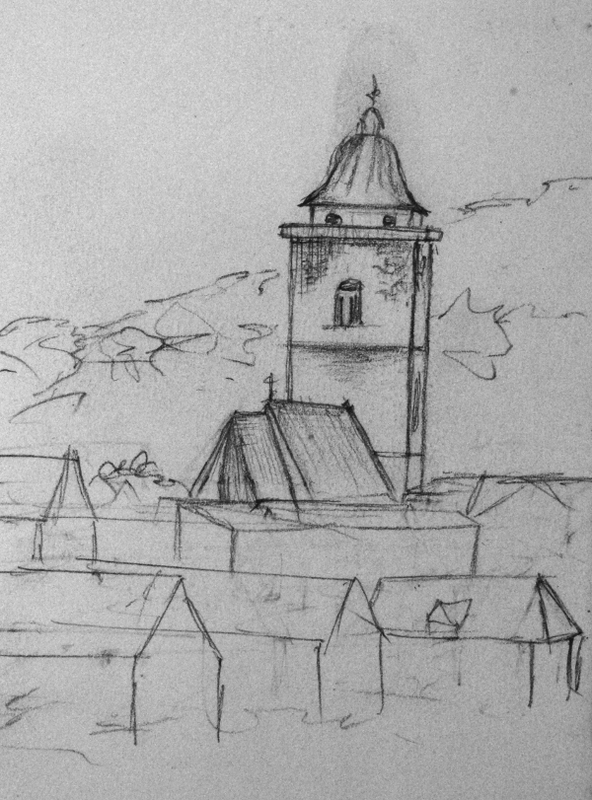 The tower doesn’t really lean, but I was trying to do the sketch in fifteen minutes so I failed to notice that rather important point. 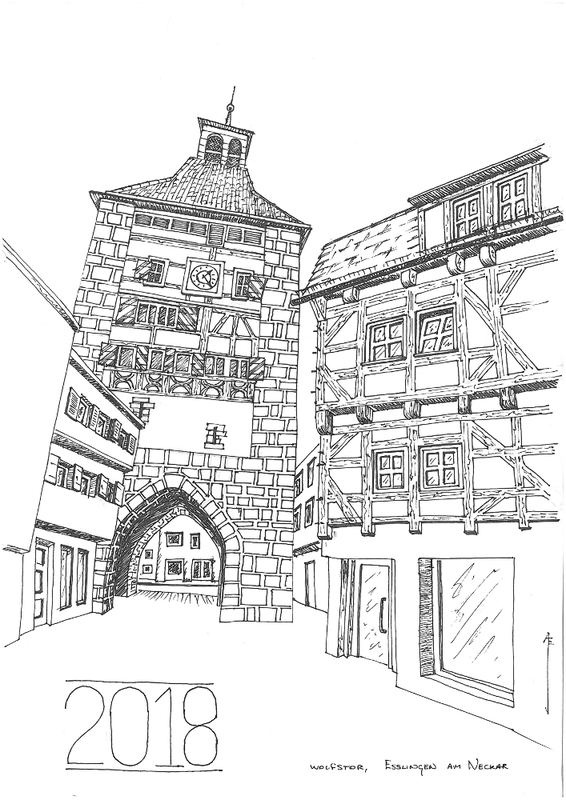 The time pressure is also why the other buildings lack a certain amount of detail.